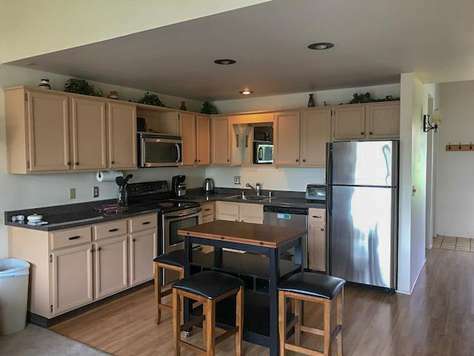 This cute little "Adult only" 2 bedroom cabin is nestled right across from the beach in the heart of Birch Bay recently remodeled and is a perfect setting for a cozy getaway. Only a few steps from the water, enjoy walks along the beach, walking distance to restaurants or just a perfect beach getaway location. Kick back and relax in the living room area and listen to music and enjoy the peek a boo view of the bay. This cabin has central air for heating and air conditioning along with additional extra plug in heaters throughout. It has a covered deck off lower main entry and a roof top deck as well. There is parking for 2 vehicles. This property is a staff favorite as it captures the feel of Birch Bay when you would come stay in a cabin and enjoy the beach. Equipped with cable TV and Wi Fi for your convenience. This is a three bedroom 2 bath home located directly across from the beach. The master bedroom has a King size bed, walk in closet and large bath with shower and cozy garden tub. Full size washer and dryer in the laundry room. Both additional bedrooms have Queen size beds and the additional bathroom has both tub and shower. There is a very large well stocked kitchen to prepare a light snack or full gourmet meal. The kitchen opens into a great room with big screen TV. Please note that there is no cable but you have at least 13 channels with antenna TV and there is a DVD player with movies or you can bring your own. It is open and spacious. Enough about this beauty with a spectacular view, lets talk about the Beach! You can sit out on your deck and enjoy the view or simply walk across the street to your private beach and have a beach fire and roast hot dogs and Smores. Clam dig, crab, beach comb and much more. There is no wifi at this property until July and August but you will be so busy you wont need it. Relax Enjoy and have some fun!! 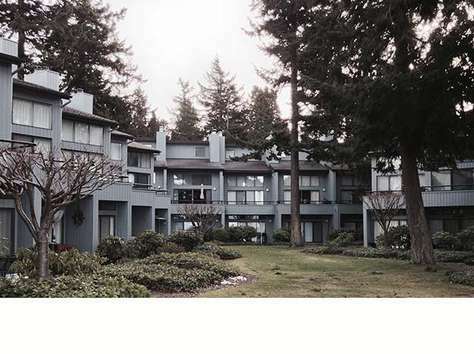 This luxury condo is right on the beach, with a gorgeous view of Semiahmoo Bay and White Rock, B.C. Step off your patio right onto the sand. This bright, cheery villa features a master bedroom with a patio, master bathroom, and queen bed. The living room also has a sofa sleeper. The second bedroom has another queen size bed, and there is also a roll away. The unit now has wireless internet for your phone and computer needs. Enjoy the close-by Resort Semiahmoo, providing spa services, a full-service marina and an Arnold Palmer designed 18 hole golf course. A barbecue and patio furniture are provided for your outdoor dining pleasure. 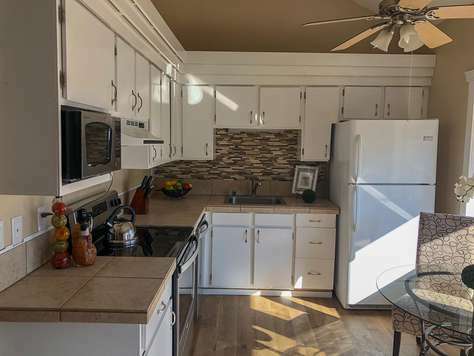 Located at the Beach Walker Villas on a 1,100-acre wildlife preserve this lower level property has a view from almost every room and if you keep a good eye out, you are sure to see harbor seals, deer, and other friendly wildlife. You are free to enjoy the tennis courts and picnic area while visiting this property. Two nights at the Beach Walker Villas and we are certain you will be back again and again!! Same old vacation....we don't think so!!!! Welcome to the Cabana Club, located just minutes by foot or car, to all the wonderful activities Birch Bay has to offer. This two-bedroom, one bath condo, includes a queen size bed in one bedroom, a bunk with queen bottom twin top in the second bedroom. The kitchen is fully equipped with dishes, glassware, pots/pans, silverware, and most other kitchen utensils. You can prepare your favorite light snack or full meal as needed. The living area has a flat-screen TV and a DVD player. There is also a wood-burning fireplace to cozy up to if you join us in the fall or winter. The sliding glass door opens onto its patio that houses the propane BBQ, a table, and chairs. 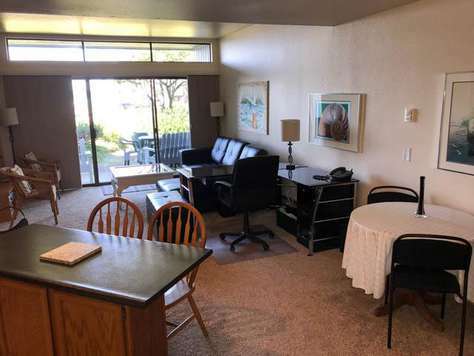 This condo just steps away from the Cabana Club clubhouse, which houses an indoor hot tub, (available year round), a Ping-Pong table, many games, and books for your convenience. During warmer weather, an outdoor pool is available (open from May 15-Oct. 1) the remaining grounds between the creek side and the buildings included horseshoe pits, volleyball area, and room for the kids to play. This older, but very clean and well-maintained complex is the perfect location for your next summer vacation or off-season get-away. 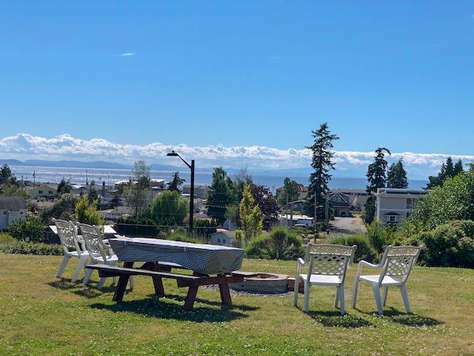 Welcome to the Cabana Club, located just minutes by foot or car, to all the wonderful activities Birch Bay has to offer. This two-bedroom, two bath upper condo has been tastefully remodeled and is a true gem. You will find on the first level of the condo two bedrooms. The first bedroom has a king bed that can be made into a set of twin beds and a nice large TV. The second has a queen size bed. There is a full bath on this level along with a well equipped kitchen. The comfortable living room does not have a TV but you won't need one as there are far to many other things to do. There is also a lovely deck that over looks the outdoor pool, large greenbelt complete with volleyball, horseshoes and fire pit. A view of the creek is an added bonus. Upstairs is the master suite with a king size bed and another bathroom. There is a sitting area with nice size T.V. and the upstairs also has a nice deck with a view of the bay and its spectacular sunsets. 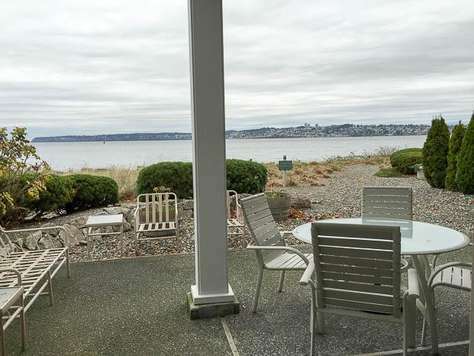 This property will surely make you want to return year after year to our hidden treasure called Birch Bay. This beautiful one bedroom one bath lower level condo recently went through a series of upgrades. Located at Jacobs Landing with an outstanding view of the water you are within walking distance to all that Birch Bay has to offer. The owners have paid attention to detail during the upgrading with new carpet, new appliances and many more special touches. While staying at Jacobs Landing you will enjoy the use of the indoor pool, hot tub, game room, outdoor tennis courts and all the other amenities this property has to offer. Your own private patio opens up to a lush greenbelt and a wonderful view of the water. A Bar B-Q is provided for those family/friend cook outs. Or just sitting back and relaxing while watching one of those famous Birch Bay sunsets. If you prefer you can always have a bonfire on the beach. Smores anyone? You and your family will love this condo and book it year after year. Reserve now as this is a favorite. Come enjoy this fully furnished 2 bedroom condo with all the comforts of home which has two bedrooms, one bath on the lower level condo at Jacobs Landing just minutes from the beach with beautiful hard wood floors, comfortable living area for your beach getaway. One bedroom has queen size bed, second bedroom has a full size bed both bedrooms have flat screen TV's mounted in each bedroom for your enjoyment. The unit has Comcast cable and Wi-Fi. Cozy up to a wood burning fireplace for those chilly nights at the beach and watch your favorite movie on the flat screen TV in the living room or your favorite DVD, then enjoy a nice patio perfect for grilling on the gas BBQ after a day at the beach. Fully furnished two bedroom, one bath lower level condo at Jacobs Landing. Granite counter tops, stainless applicances, electric fireplace and many other upgrades. Each bedroom has a Queen size bed and the living room has a fold out sofa. There is a nice patio perfect for grilling on the propane BBQ. You may enjpy the indoor pool, hot tub, outdoor tennis and other amenities at Jacobs Landing. Walking distance to the Birch Bay attractions and across the street from the beach. An upper level 2 bedroom 1 1/2 bath luxury condo at Jacobs Landing in Birch Bay. The owners of this property are always making sure you have the comforts of home. There is a fully equipped kitchen perfect to prepare a snack or a gourmet meal. The living area is tastefully decorated to include DVD, VCR, CD player, wood-burning fireplace and a small but nice deck overlooking a lush green belt. Upstairs there is a loft bedroom along with a 1/2 bath. Centrally located in Birch Bay you are only a short distance from the beach and all the fun activities the locals have to offer. Enjoy the clubhouse with indoor pool, hot tub, game room, racquetball and outside tennis courts. We are hapyy to have this cozy 2 bedroom 1.5 bath condo back available for rent. Another Jacobs Landing gem! Centrally located on property, you are a short distance from the clubhouse and a short distance from the beach. 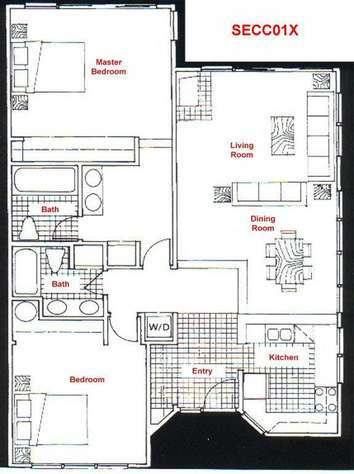 This is an upper unit that is fully furnished with all the comforts of home. The lower level bedroom has a Queen size bed, on this level there is also a washer/dryer, full bath, fully equipped kitchen, livingroom with wood burning firepace and a lovely deck to soak up the sun. Upstairs you will find a great space with a queen bed, 1/2 bath, desk and TV. This unit also has complimetary wifi. While here enjoy the clubhouse with indoor pool , hot tub and much more. Short walk to all Birch Bay has to offer. Jacobs Landing is a great property and this is a great unit. One of the few upper level two bedrooms with two baths. This condo is elegant and fun. A fully stocked kitchen for your cooking and entertaining needs with granite counter tops and stainlerss appliances. The upstairs bedroom has a queen size bed and bath and the lower bedroom has two twins, with an additional large deck to enjoy the sun. The living room has a wood burning fireplace and deck for BBqing or just relaxing with a good book. This is a Vacationville favorite ! This one bedroom one bath has been recently remodled and is perfect for a get away! The bedroom has a Queen bed along with a T.V. in case you just want to relax in bed. The living room has a nice sectional and although it is not a fold our sofa sleeper, a small child or teenager could sleep fine there. There is wifi available for your use. A wood burning fireplace for those chilly fall nights. Fully furnished you will find everything you need to stay a night or a week or a month :-) Indoor pool, hot tub and other amenities are yours while you stay at Jacobs Landing. This one bedroom one bath has been beautifully remodled and is perfect for a small family get away! The bedroom has a Queen bed. The lving room has a sofa sleeper perfect for kids. You have all the amenities of home, fully equipped kitchen, wood burning fireplace, lovely deck with propane BBQ and deck table and chairs. The deck also allows easy access onto the greenbelt. A short walk to the clubhouse with indoor pool, hot tub, tennis courts and much more. If it is a sunny day go to the beach which is another short walk. There is no washer and dryer in the property but we do provide extra towels. A truly lovely condo with a great location ! 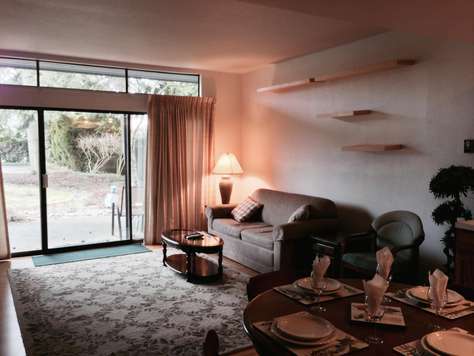 This lovely 2 bedroom 1 bath lower level condo is located at Jacobs Landing in the heart of Birch Bay. Recently upgraded you will enjoy hardwood and tile floors, light colored carpets, a fully equipped kitchen with new dishes and glassware, washer/dryer, microwave, dishwasher,fireplace, and much more. One bedroom has a queen bed and the other has a set of twins. The patio looks out over a lush greenbelt and is perfect for those peaceful days or nights. You are close to the clubhouse with indoor pool, hot tub, tennis courts and many more property amenities. Within walking distance to all that Birch Bay has to offer you and your guests will return again and agian! This upper level two bedroom condo is located back by the clubhouse at Jacobs Landing. 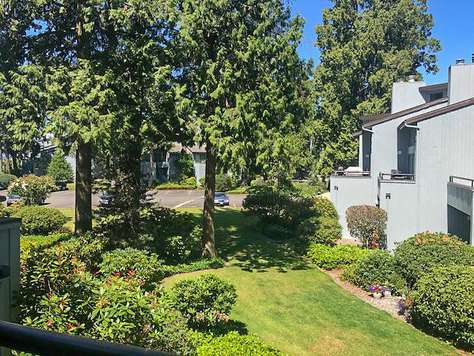 It has a wonderful view of Mount Baker and is within a short walking distance to the beach. 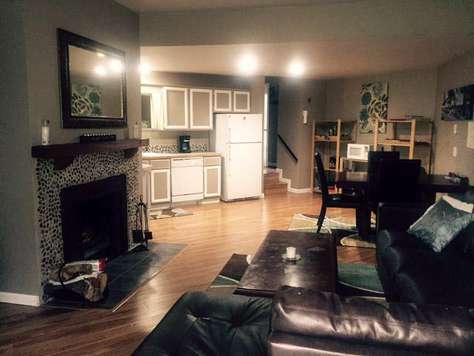 The unit is very cozy with a wood burning fireplace, a fully equipped kitchen and many more comforts of home. There are two decks for you to relax and soak up the sun. One deck overlooking Mt. Baker and the other off of the downstairs bedroom . Jacobs Landing is centrally located in Birch Bay so you are within walking distance to restaurants, bike rentals, kayak rentals, the famous C-shop and much more. Walk to the beach and sit and enjoy a spectacular sunset, yes, we still sit and watch the sunset in Birch Bay. Quite, reasonably priced and a great location! This lower level two bedroom condo is located back by the clubhouse at Jacobs Landing. 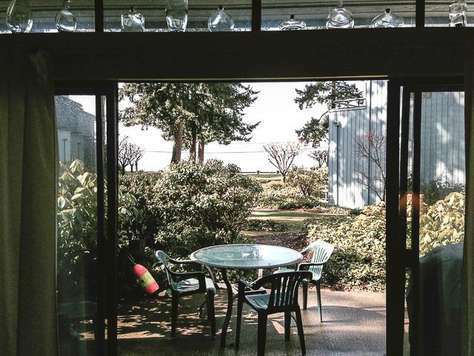 It has a wonderful view of Mount Baker and is within a short walking distance to the beach. The unit is very cozy with a wood burning fireplace, a fully equipped kitchen and many more comforts of home. Jacobs Landing is centrally located in Birch Bay so you are within walking distance to restaurants, bike rentals, kayak rentals, the famous C-shop and much more. Walk to the beach and sit and enjoy a spectacular sunset, yes, we still sit and watch the sunset in Birch Bay. Quite, reasonably priced and a great location! Jacobs Landing is centrally located in beautiful Birch Bay. Although this is a beautiful condo we think the best part is the amazing view! A lower level one bedroom 1 bath condo making it great to go from patio to grass and grass to beach :-) There is a queen size bed in the bedroom a fully equipped kitchen, fireplace and washer / dryer for all the conforts of home. There is a double sofa sleeper and this owener will allow a child to sleep on the chaise lounge in te unit. The unobstructed view of the water is spectacular. A great place to sit and enjoy Birch Bay's amazing sunsets. Very well maintained you and your family will Love this condo. There is plenty of deck furniture and the patio backs onto a great greenbelt. Jacobs Landing also offers a clubhouse with many amenities such as a pool, hot tub tennis courts and of course if it is a sunny day you have the beach right across the street! We hope to see you soon in Vacationville !! This is a very cozy getaway, decorated in light tan and shades of green to make it feel like a home away from home. 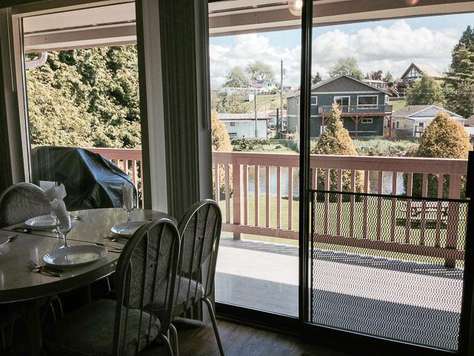 From your private deck you have a spectacular view of Birch Bay and the Canadian Gulf Islands. A barbecue and patio furniture are provided for your outdoor dining pleasure! Located at Jacobs Landing in Birch Bay you are within walking distance to many local activities. The lower bedroom has a set of twin beds and a large deck for soaking up the sun. There is TV in every room and lots of added touches. The upstairs master bedroom has a queen size bed and 3/4 bath. There is a washer/dryer, DVD, fireplace, dshwasher and all other comforts of home. Indoor pool, hot tub, outdoor tennis and much more. The perfect spot to enjoy all Birch Bay has to offer! The Tides at Birch Bay is a community of craftsman beach cottages nestled in 11 acres above the bay and only one block from the beach. This two bedroom two bath cottage has class, style and elegance. The kitchen comes equipped with all you need to prepare a large meal or light snack. The spacious living area has a gas fireplace and large TV. The deck is the perfect place to sit with a cup of coffe or cur up with a glass of wine. Master bedroom offers a walk in closet, private bath and large flat screen TV. Upstairs you have a sitting area and the second bedroom with a Queen size bed. The Clubhouse offers a perfect place to entertain larger groups with a fully equipped kitchen. There is also a pool table and TV. Stay cool in the beautiful outdoor heated pool or totally relax in the jacuzzi while glancing out across the bay. The large common area also has amazing views of the bay, the Gulf Islands to the west and the San Juan Islands toward the south. Plan an impromptu picnic at dusk to marvel at yet another amazing Birch Bay sunset then wrap up warmly and do some star gazing while roasting marshmallows over the large fire pit. Please note--this property is available for extended stays only. 30 days or more. Perfect for relocation packages.